Announced on Tuesday, some wondered if Amazon’s new one-touch ordering buttons were a joke…but they’re not. They’re small, stickable (or hangable) ordering buttons for products you’re likely to run out of frequently. 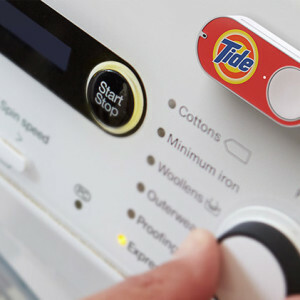 So, put at Tide one on your washer and a Folgers one on your coffee pot and when you’re running low, push the button. A single order will be automatically be sent to Amazon–even if you accidentally press it 10 times. You confirm the order and viola! Your new laundry detergent will be there in two days – why two? Because it’s only for Prime members by invite only at this time. There are a LOT of products you can do this with. I’ve got to say, although I’m a Prime member, I’m sort of siding with this New Yorker commentary: And the idea of shopping buttons placed just within our reach conjures an uneasy image of our homes as giant Skinner boxes, and of us as rats pressing pleasure levers until we pass out from exhaustion…That’s the real dystopia: not that our daily lives could be reduced to a state of constant shopping but that we might ever have to, even for a moment, stop shopping. Although Amazon’s website no longer looks like it’s from 1999, many of the jokes are still out there to enjoy. I rounded up some of the best in my blog earlier in the week. This week the product-selling juggernaut launched Home Services. Need a plumber? Gutter cleaning? Have a grill to assemble? Amazon can hook you up with all of these services plus about 697 more. Sure, you could always hire someone yourself, but Amazon says they do the leg work for you—they only use businesses that are licensed, insured, and pass a five-point background check. Also, technicians must pass a six-point background check and you can hire someone in about a minute. It’s now available in 41 states. If you try it, let us know what you think! Scrapbook lets kids under the age of 13 have an official Facebook presence without having their own profile. Instead, parents can tag photos of their kids or pets and make a digital scrapbook. As TechCrunch said, “this lets parents collect photos of their baby, toddler, or pre-teen in a centralized place they can share with friends and loved ones.” Apparently Facebook is figuring out how to pass that scrapbook to the child once he/she is old enough to take over. To start one Facebook says: To start a scrapbook for your child, go to your profile, click on About and click on Family and Relationships. There, you’ll see an invitation to create a scrapbook; just click Get Started. If you’ve already added a child to your profile, you can click Add Scrapbook next to his or her name. This feature will start rolling out today in the U.S. on Facebook for desktop, iPhone and Android. Today’s GPS works by triangulating your location using satellite data – which is great…unless there are blind spots, jamming efforts, or just satellite issues. To fix these problems the Defense Advanced Research Projects Agency is planning to develop something new. Not a lot of hints but agency did say they’re investigating “radically new technologies…including novel inertial measurement devices that use cold-atom interferometry; chip-scale self-calibrating gyroscopes, accelerometers and clocks, and pulsed-laser-enabled atomic clocks and microwave sources.” I’m not 100% what all that means, but it sounds awesome, doesn’t it? Tesla CEO Elon Musk said this week that Tesla will be announcing a new product line at the end of this month but it’s NOT a car. No hints as to what it will be although some are speculating it’s some kind of battery pack to power a whole home. Remember how I told you a few weeks ago that Google narrowly avoided an antitrust lawsuit here in the U.S.? Well, they may not be so lucky in Europe. The Wall Street Journal says the European Commission is gearing up to sue, talking with companies who have filed complaints against Google. Engadget describes this light, called the Hue Go, as a “salad bowl of light” which seems pretty apt. You charge it up and can take it on the go for up to three hours, and like the rest of the Hue line, can be controlled through their app. You might want to use on the of the five presets such as “Nigh Adventure” or “Enchanted Forest” (they’re as bad as lipstick and nail polish names – who knows what in the heck they mean!). It will sell for $100 and is expected in stores at the end of May.